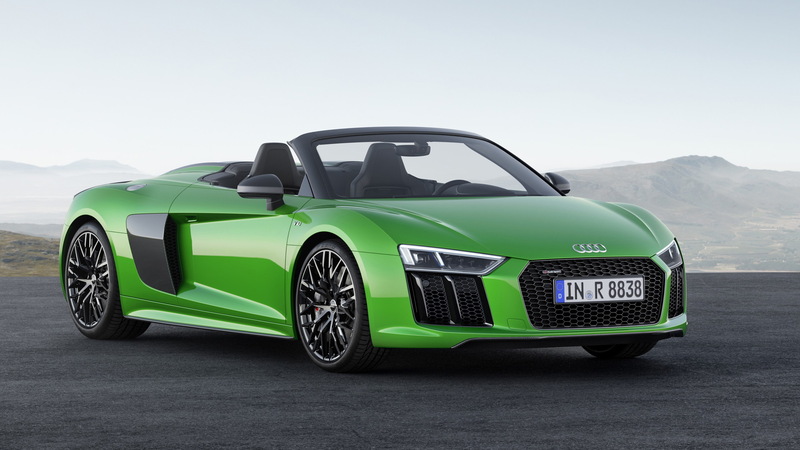 When the second-generation Audi R8 Spyder made its debut at the 2016 New York auto show, the range-topping V10 Plus model was noticeably missing. 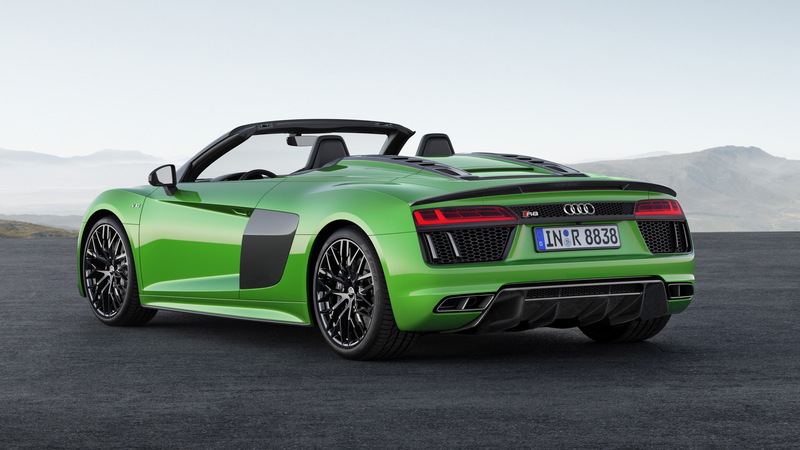 It turns out Audi was simply saving the best for last as it’s now finally added the R8 Spyder V10 Plus to its range. There are no surprises here. The car’s 5.2-liter V-10 is the same unit found in the R8 V10 Plus coupe, rated at 610 horsepower and 413 pound-feet of torque. Mated to a 7-speed dual-clutch transmission and powering all four wheels, the engine propels the R8 Spyder V10 Plus to 62 mph from rest in 3.3 seconds. The top speed is 203 mph. 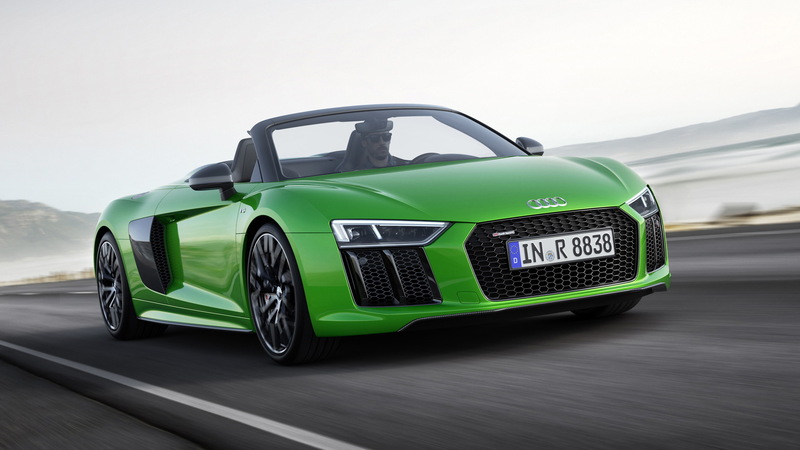 Those figures correspond with a 0-62 mph time of 3.6 seconds and a top speed of 197 mph for the regular R8 Spyder V10 whose 5.2-liter V-10 delivers 540 hp and 398 lb-ft. The roof of both models is a soft-top that can open or close in 20 seconds, including at speeds of up to 31 mph. Of course, we'd suggest planning ahead and doing it before the rain starts. As this is the range-topping model we're talking about, you get plenty of standard goodies. The list includes carbon fiber-reinforced plastic seat frames, carbon-ceramic brakes, Nappa leather trim, the top-shelf infotainment system, and a leather-bound, multi-function steering wheel. 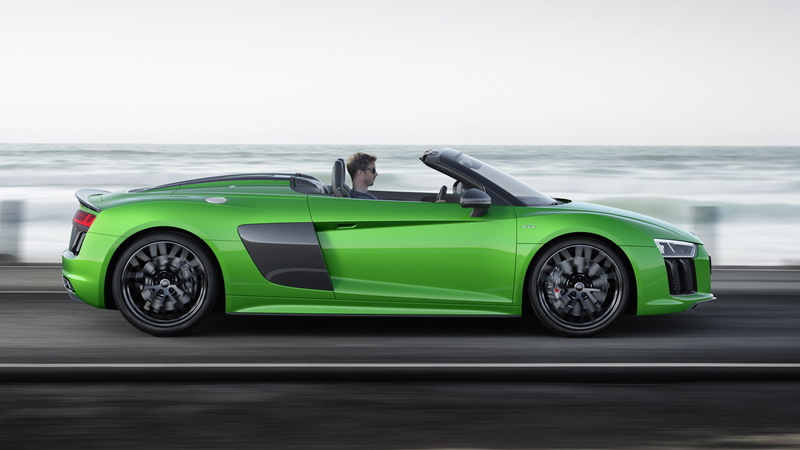 Audi is yet to announce availability of the R8 Spyder V10 Plus in the United States. 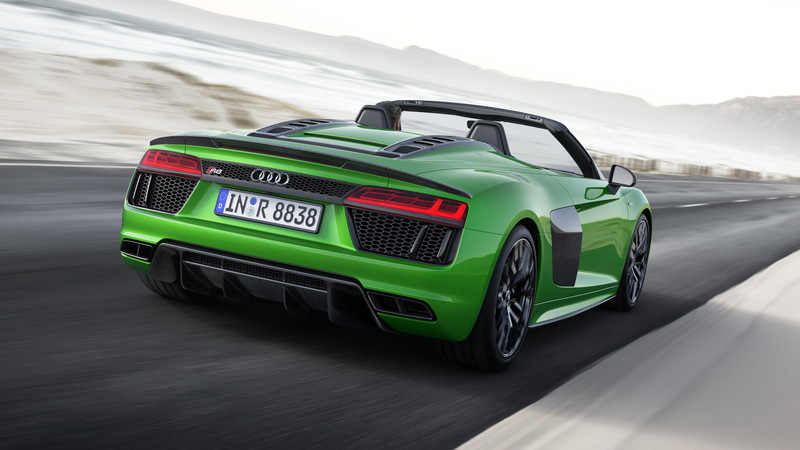 When it finally does arrive, expect a steep premium on the $176,350 you have to pay for the regular R8 Spyder V10. Potential rivals include the Aston Martin Vanquish Volante, Ferrari California T, Lamborghini Huracán Spyder (a twin under the skin with the Audi), Mercedes-AMG GT C Roadster, and the new McLaren 570S Spider. While this generation of the R8 isn’t expected to offer a V-8 option like the previous generation, there are rumors a turbocharged V-6 engine will be introduced next year. We might not see such an option here, however. It’s likely designed for markets like China where punitive taxes are placed on cars with high-displacement engines.